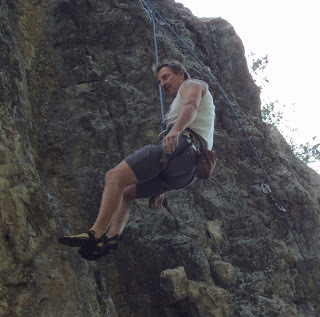 I recently read an article by Tanya Laing in RVwest magazine on rock climbing that got me thinking I should say something about two climbers I met here last summer. 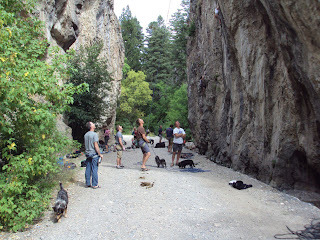 There is a stellar climbing area in the South Willow at the upper narrows for advanced climbers with about 17 routes, most of them rated at 5.12. There are four 5.12Cs (the most difficult is 5.15). 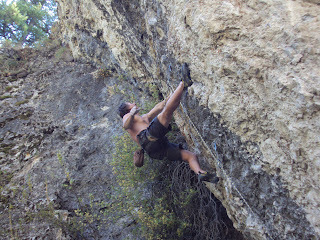 One of the most difficult routes in Utah, a 5.14C called the Big Smile is here. 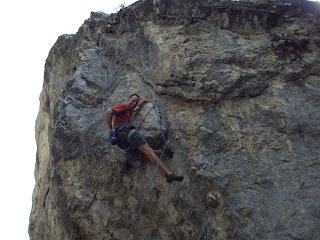 Scott and Jon put in a 5.12C a couple years ago called Old School. So far less than a handful have managed to reach the top. These guys are regulars up here and put in LONG days. They are in phenomenal shape and could easily crush my hand. I wonder if they notice my hesitation whenever they offer to shake hands. Up until recently, I just stopped and talked with them and never watched them climb. Lately I’ve been taking the time to watch and ask questions. Jeez, was I impressed. I now finally understand why one would choose to climb. Scott and Jon really love climbing and excel at it. They joke about how they hear other climbers talk about the start of climbing season each year. It never ends for these twothey climb all year round. 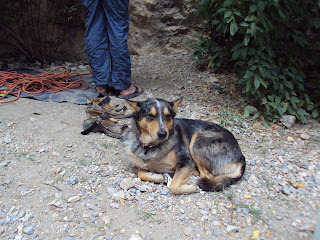 Scott’s dog, River, is always with them. I can’t see how Scott can be so relaxed in the shot of his being lowered down after doing a pitch, with both hands just hanging down. I’d have a death grip on the rope, not that it would do any good. With the road closed this summer, some of the best climbers in Utah came up one day and made it a family affair. Babies, toddlers, spouses, dogs, strollers, bicyclesit was a hoot. What a fabulous group. Very friendly and helpful with route tips. 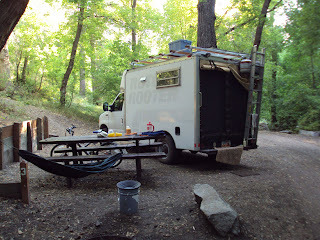 A camper stayed in the canyon one night and hiked the crest loop. Got some exercise with a 3,500’ elevation gain to the 11,000’ peak. Rick works a few months a year down in Guatemala leading treks for Quetzal trekkers. Not bad for a grandfather. All profits go to support street kids and children at risk in Quetzaltenango through Escuela de la Calle. Rick was on his way to Burning Man and then off to China for three and a half months. Keeping in shape as one gets older sure can spice up one’s life. Bill has recently retired and outfitted a Rotor Rooter truck into his home. He has plans to head down to Mexico for the winter. The truck still has the roll-up door in the back but he installed a heavy-duty screen door across the back for when it is warm. SEALs were back a couple more times. One time some hiked up the next canyon to the south the night before, practicing a night infiltration. They were set up for long-range surveillance before dawn. It’s one of the things they do in areas where they are sent, coming in at night and not moving around during daylightobserving the villages and trying to identify the Taliban or planning an operation. This canyon is supposed to be somewhat like the terrain in Afghanistan. They have to get acclimated to the elevation over there so they do hikes at different elevations with the last one here at 11,000’. One time there was a group of 35! Can you imagine what a force of 35 SEALs could accomplish! I was talking to one of them about the kind of stuff they do. He said he would much rather be doing special forces kind of assignments than those of the standard army or national guard. Those soldiers have to patrol the areas during the day and make easy targets. SEALs go in quietly at night, do their thing, and get out. Granted, there are occasional firefights. Different strokes. Never thought about it that way. I’m sure thankful that there are people who do this type of thing when it is necessary. I would have a hard time with it. 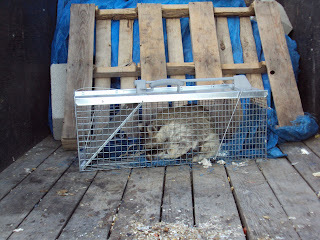 Still dealing with raccoons. Trapped eight. They have a tendency to pull whatever they can reach out and grab into the cage. 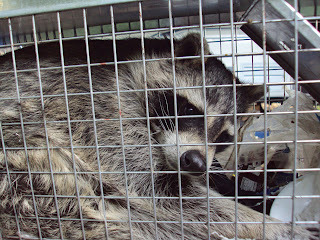 One night I put the Havahart too close to the trash bags and the big guy ended up with so much trash in the cage that he could hardly turn around. You can see in the trailer shot that I generally cover the trash bags with a tarp, pallets, and cinder blocks. 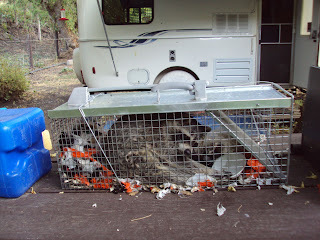 Pretty worthless against raccoons but it does save some of the bags. What a mess they can make! Wonder if they are all one family. Two were pretty big and six were much smaller. The first couple pretty much took it all in stride. The big one definitely did some growling. The seventh one (one of the little ones) was REALLY pissed. She/he was the only one that I was a bit concerned about as I went to release him. I could imagine him thinking something like, ‘Oh yes! The door is open and there’s freedom! I’ll just run back around and rip this guy’s throat out before diving down into the brush.’ The last little one was making a twilling/chirping sound. 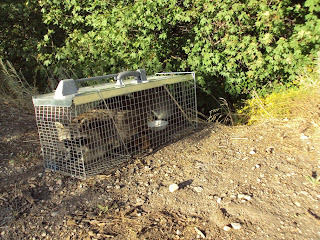 A wildlife biologist told me it’s her way of saying, ‘Hey, mum, I need a little help here.’ She was also the only one that did not immediately shoot out of the cage when the door was opened. She just sat there for a few seconds and then leaped a good six feet down the slope. Very impressive. Well, this all was quite an experience. I let them all go in the same spot so, hopefully, there was a joyful family reunion. 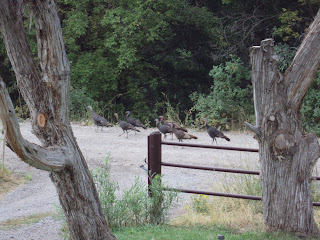 Here’s a shot of some of the locals out for their early evening stroll. 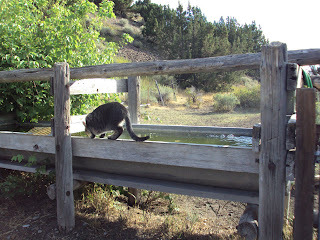 Meadow taking a drink from the horse trough up by the barn. 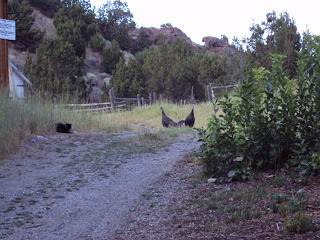 This shot of Onyx with some of the wild turkeys reminded me of the shot I posted last summer. A shot from the pasture behind where I’m staying, looking to the west. I hiked up to the back-country skiers cabin the morning before the forest service was going up there to tear it down. This is probably the last photo of the cabin. 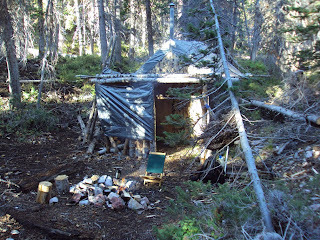 I packed in a low rider chair, a thermos of yerba mate, a book and spent three stellar hours up there. One morning the following week, Cathy and I hiked back up and took the next shot. The forest service will be returning to rip up the floor. 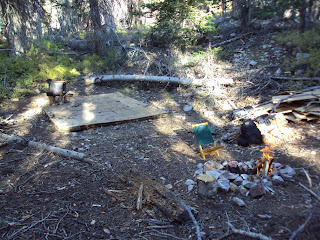 Dedicated Hunters will be coming up with packhorses to get all the plywood and stove out of there. I hiked the crest loop again the other morning. 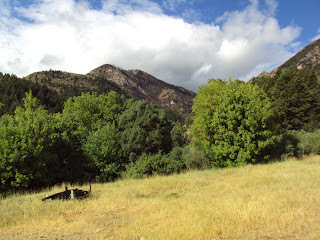 Saw over thirty deer up Dry Fork, all doe and little ones. After doing extensive research on how the little ones come about, I deduced that there must have been bucks around, just did not see any. The September full moon is called the Full Harvest Moon. Always the full Moon occurring nearest to the Autumnal Equinox. Corn, pumpkins, squash, beans, and wild rice—the chief Indian staples—are now ready for gathering. ‘Time is a companion that goes with us on a journey.